Well Tony Burke and Simon Crean are doing a job that would make the United Nations proud. They are such good negotiators. Tony passed through Deniliquin yesterday at around about 30,000 feet and 700 kilometres an hour on his way to somewhere else in an air force jet. That is his way of covering the ground. Simon was actually in Deniliquin in a meeting with a select panel of people but he appeared to pass through the room at only a slightly lower velocity as Tony was passing overhead. Reports from those at the meeting say that he spoke to the chosen few for less than five minutes on the basin plan (See Attachment)*. Simon has obviously come to the conclusion that unfortunately you have to actually go to a place before you put out a media release. He has yet to learn that you should actually make your media release an accurate reflection of the visit. The bush telegraph is a pretty good honesty serum when it is matched up to his media release. If you didn’t laugh you would cry because this is the process that is dealing with the mechanism that feeds Australia and keeps the cost of living on groceries down for working families across our major cities. If they show the same management acumen as they showed with ceiling insulation, when they set fire to 194 houses, or the crisis budget for a crisis government, which has just informed us that we are going to break through our third debt ceiling, or the rollicking fiasco of the carbon tax on our solo crusade to cool the planet from a room in Canberra, then I have a real fear for what is about to happen to Australia’s food basket. It looks awfully like the Labor dynamic duo of Simon and Tony would find the job so much easier if they didn’t have to deal with people. Labor has granted almost two-thirds of the regional development funds to Labor electorates, or to electorates which have supported a Labor Government, even though Labor holds just over one third of the seats in regional Australia. Today Simon Crean announced the successful projects under the Regional Development Australia fund two months later than originally promised. Labor has given two-thirds of the funds to one-third of the seats. According to the parliamentary library Labor holds 23 out of the 62 non-metropolitan seats. The reason they have done this is because they are financially rewarding their members in their seats with your money. Maybe that is to be expected but maybe they should be upfront about it. Labor has taken their partisan view of politics to regional Australia, rather than do what is honourable and egalitarian, they have been parochial. I suppose it is not that surprising but it is disappointing and I wouldn’t hold your breath waiting for Mr Windsor and Mr Oakeshott to complain about it. I just hope this is not the price for the support of Labor members in Mr Crean’s leadership pitch. The rollout of Labor’s Regional Development Australia Fund, promised to Mr Windsor and Mr Oakeshott last year, is running at least two months behind schedule, Senator Joyce said today. Senator Joyce said “It seems unlikely that the successful projects will be announced before the middle of next month at the earliest. The Government’s promises on regional spending are proving to be empty. 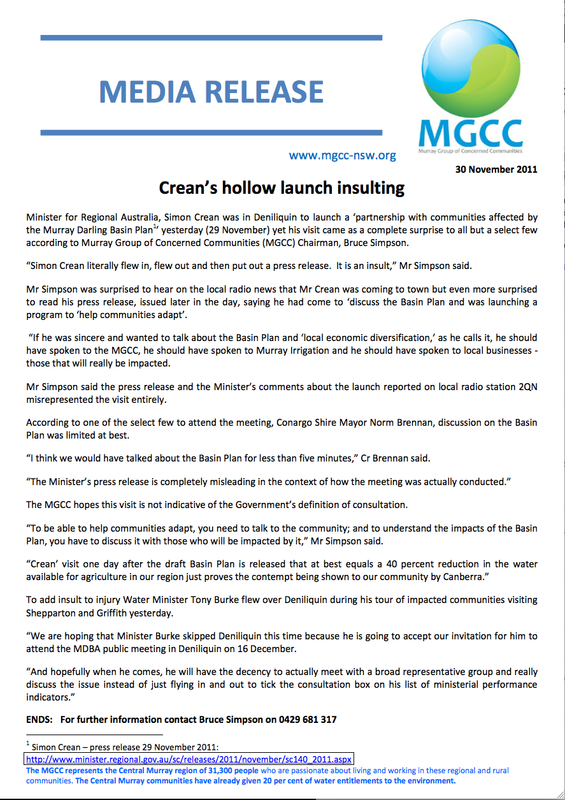 But Mr Crean has found time over the past seven weeks to conduct 9 marketing sessions on the carbon tax involving Regional Development Australia bodies in Gippsland, Geelong, Gladstone, Mackay, Queanbeyan, Rockhampton, Hunter, Whyalla and Townsville. “Minister Crean seems to have plenty of time to sell a carbon tax but not enough time to do what he is supposed to be doing as Minister for Regional Australia. Just when Australia needs strong leadership this is a government that is becoming increasingly distracted by broken promises, failed policies and scandals.” said Senator Joyce today. Figures released by the NSW Treasury this morning shows that a carbon tax will hit regional Australia the hardest, shadow Minister for Regional Development, Senator Barnaby Joyce said today. “NSW Treasury figures show that the carbon tax will lead to 31,000 lost jobs in NSW but over 26,000 of these jobs would be in regional Australia, including 18,500 in the Hunter, 7000 in the Illawarra and 1000 jobs in the central West. “If Mr Crean wants to continue his “embrace the challenge” tour of regional Australia he needs to come clean with them how they are meant to embrace the challenge of fewer employment opportunities. “This should be no surprise to anyone who understands regional Australia. Regional Australia is where most of our mines, factories and electricity generators. A carbon tax will clearly hurt regional Australia the worst. “The NSW Treasury analysis also shows that electricity prices will increase by 15 per cent, not the 10 per cent promised the Prime Minister. That will amount to an extra $500 a year for the average household in higher electricity costs alone. “Australian Government Treasury figures show that people in regional NSW pay 25% more for electricity than those in capital cities. That means regional Australia will bear the brunt of these price increases too. Another reason why we must replace the Goose with a proper accountant. Simon Crean announced today that $1 billion worth of projects had applied for the first round of the $1 billion Regional Development Australia Fund. “The problem is that there is only $300 million in the budget over the next four years,” said Senator Barnaby Joyce today. “I am currently travelling around northern NSW. Northern NSW is actually in regional Australia. You know what it’s like – trees, wildlife, long distances between pubs, that sort of stuff. Most of the area is kind of dark at night. Simon, regional Australia does not include the Antarctic, which it does in your regional budget documents, it does not include Perth, where your biggest “regional” project is being funded, and it does not include Adelaide, where migrants can come to live under your Regional Sponsored Migration Scheme. Now I know Simon you have done a smoke and mirrors trick in the definition of regional Australia, and now you are trying to pull the same swiftie with the definition of money. You see Simon it’s quite simple, you only had $300 million allocated to the Regional Development Fund in the forward estimates, but now $1 billion worth of projects have applied. Now to keep things nice and simple Simon, you have only got $300 million to spend, but in your media release claim that $1 billion of projects have applied for a $1 billion fund.